The billionaire businessman David H. Koch has left his position on the board of trustees of the American Museum of Natural History (AMNH) after serving on it for 23 years. A spokesperson for the museum told the New York Times that Koch’s departure, which became official on December 9, was not a response to the demands of many scientists and activists that Koch be kicked off the boards of the AMNH and the Smithsonian’s National Museum of Natural History (NMNH). Koch had served on the AMNH’s board since 1992, donating about $23 million in as many years. In recognition for his support, the museum’s dinosaur wing was renamed the David H. Koch Dinosaur Wing. In recent years, however, Koch’s positions at the AMNH and its Smithsonian counterpart have increasingly drawn criticism for the apparent incongruity of having the executive vice president of a company, Koch Industries, responsible for enormous greenhouse gas emissions and hundreds of oil spills on the boards of major science institutions. 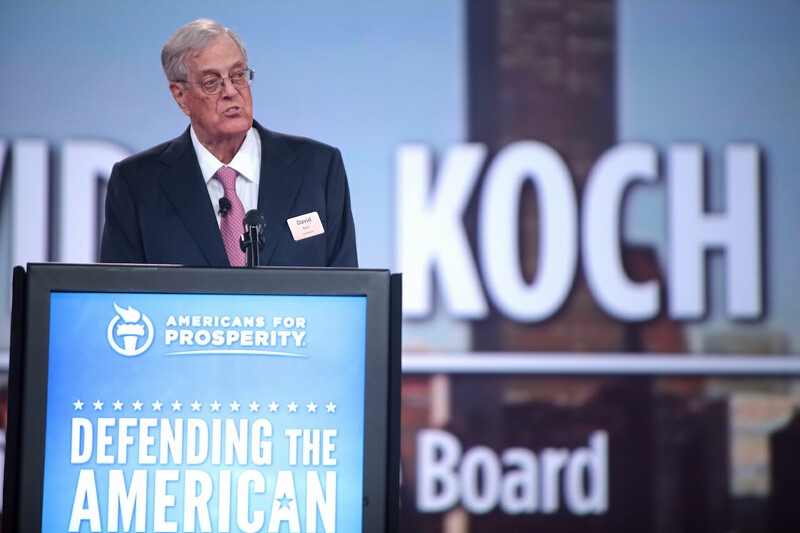 Another cause for concern was Koch’s support, to the tune of over $67 million according to some, of groups and organizations that deny climate change. Last March a group of 39 scientists released an open letter demanding that Koch be kicked off the two natural history museums’ boards. 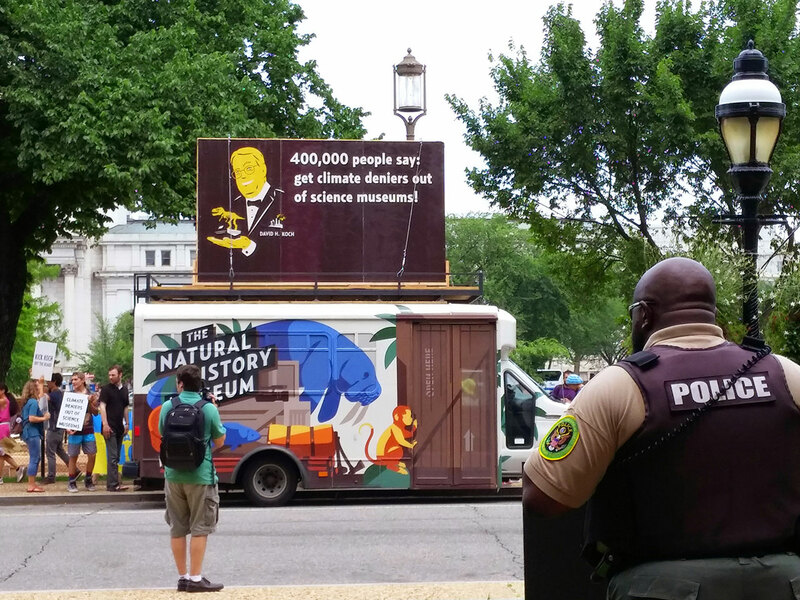 In June protesters marched in Washington, DC, to deliver a petition signed by 430,000 people to representatives of the Smithsonian Institution, demanding that it kick Koch off the advisory board of the NMNH. All that had nothing to do with his decision, according to his spokesperson, Cristyne Nicholas. “He was not swayed by that at all and it absolutely did not factor into his decision,” Nicholas told the Times. 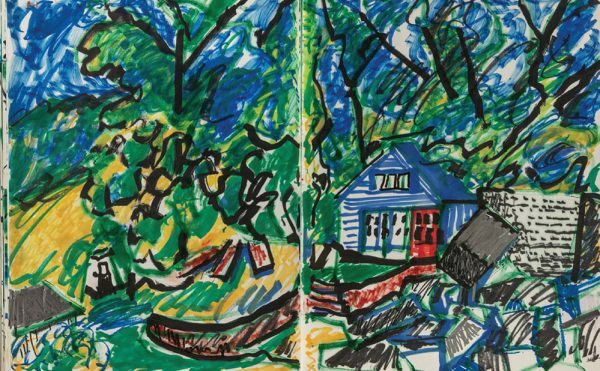 “He remains supportive of the museum. … It is just that he does not have time to attend the board meetings.” Nevertheless, activists who’d demanded his departure are heralding this as a victory. “Regardless of official explanations, it is undeniable that Koch’s board position was the cause of great controversy over the last year,” said Beka Economopoulos, director of the art and activism collective Not An Alternative and co-founder of The Natural History Museum, a group scrutinizing the information disseminated by science museums. “Koch’s departure is an important step forward for the rapidly growing museum liberation movement that aims to free cultural institutions from ties to fossil fuel companies and other private interests,” Economopoulos told Hyperallergic. When asked which museums are the most attentive to the issues of the liberation movement, she cited the California Academy of Sciences in San Francisco. “They have one of the greenest buildings in the world — it generates more electricity than it takes in. They do a ton of programming out in schools and in the community. They don’t serve any junk food at the museum. They have a ton of cool initiatives,” she said. Koch still serves on the boards of some 20 institutions, including the Smithsonian’s NMNH. Last year the unveiling of the Metropolitan Museum of Art’s David H. Koch Plaza was met with protests.